Mythical Lairs has added a new Prison Complex to their Dungeon Terrain Kickstarter campaign. I promised I was working on something special for this week, and am happy to announce that it is now available! Introducing the NEW PRISON COMPLEX! 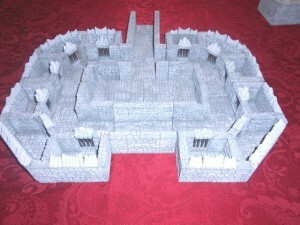 This 10-piece set features 4 generous corner cell blocks that work together to form an elaborate prison system, complete with interior guard room! Each block features 3 cells large enough to hold at least 2 standard sized mini's, and each has a removable grate doorway. Many more pictures are also available on the website under the "Rooms" section. As always, your support is very appreciated - without YOU I wouldn't be able to keep putting my ideas into great new pieces to offer!